5 reasons you'll love the more expensive, less convenient Ventra Card! With today being the last day to load money on my trusty Chicago Card (which will be dead by November 15th), I’m taking the leap of faith into our city’s half-billion-dollar transit system known as Ventra. 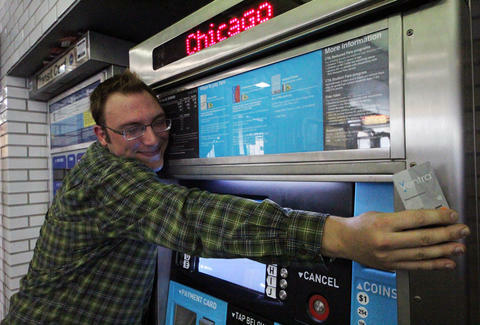 From parking meters to public schools, we’re known for taking care of business here in the Second City, so let’s pass through those privatized turnstiles and convert to the Ventra Card experience. 1. Single rides cost more! Instead of shelling out $2.25 (who carries around quarters anymore? What, am I waiting to use a pay phone? ), single-ride Ventra tickets are a smooth, even $3 a pop. Just think -- that’s less money you have to haul around, and by the Biggie Smalls Transitive Property of Currency, less money, less problems! 2. Double-dipping! Come on, who hasn’t double-dipped every once in a while? Nacho chips, chicken wings, breadsticks... guilty as charged. Well, your new Ventra Card loves double-dipping too. Keep the transit card in your wallet next to your Chase Bank card, and as you touch it to the touch pad, it sometimes debits both accounts. Your Ventra is naughty, just like you! 3. Registering time! If I had to have only two passions in life, it’d be safe to whittle that list down to digging through emails and waiting on the phone for customer service reps. So when I was unable to register my Ventra Card via the phone because I needed an access code and then couldn’t get an access code online because it wouldn’t accept my card info, I got to do both. So many times. It was AMAZING! 4. Credit/debit cards for everyone! Sure, you don’t HAVE to use your Ventra Card to make retail purchases, but that shiny MasterCard logo on the front is so damn enticing. And why not? The convenience fees for ATMs and cash withdrawals are hidden, so... out of sight, out of mind! 5. Twists and turns! Hotline hang-ups, full-fare charges on transfers, inaccurate balances, waiting months to even get a card -- and when it finally comes around, there might even be 100 Ventra Cards shoved in your mailbox. Breathe it in. Life’s a journey, and the CTA has just thrown some fun new hurdles in your way to make that journey all the more interesting. Tell us about your fun experience with Ventra in the comments below!